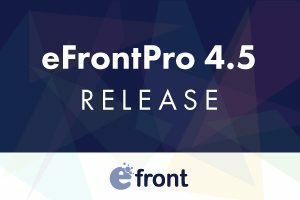 Epignosis LLC has announced the immediate availability of the latest update of its Learning and Talent Development Platform, eFrontPro version 4.5. San Francisco, September 8th 2016 - Epignosis LLC has announced the immediate availability of the latest update of its Learning and Talent Development Platform, eFrontPro 4.5 update. This release's major features are the introduction of Skills gap testing functionality and native integration with the popular eCommerce service Foxy Cart. As usual, the new release also comes with an assortment of improvements, bug fixes, and workflow enhancements. The new Skills gap testing functionality in eFrontPro 4.5 is part of a planned series of Skills management features that will be introduced in upcoming eFrontPro updates. eFrontPro's 4.5 Skill-gap testing engine allows instructors to determine any gaps in their learners' skills and gives them insights into their understanding of particular topics, so they can create or adapt their training programs to better respond to their needs and abilities. Users that passed their skills-gap tests successfully, get the relevant skills associated with those automatically assigned to them. In addition, eFrontPro's skill-gap testing engine has the capability to automatically suggest certain courses to employees that failed or performed poorly on particular tests, thus helping automate initial placement and course assignment. The newly arrived Foxy Cart integration adds to the already comprehensive list of native eFrontPro integrations, to provide support for the popular third-party eCommerce and Shopping Cart management service. eFrontPro's Foxy Cart integration gives users interested in eCommerce a full-featured sales solution, allowing them to enjoy a powerful cart and shopping solution right from their platform, hassle-free. Epignosis is a leading technology vendor specializing in eLearning solutions. With a strong and proven portfolio of products, it caters to the learning needs of modern organizations, no matter their size or complexity. Its product portfolio includes eFrontPro, an enterprise LMS geared towards large businesses with high user volumes and advanced customization and security requirements, TalentLMS, a cloud-based versatile LMS that serves as a powerful yet simple solution for businesses and TalentCards, a mobile learning app that delivers bite-sized training in the form of learning cards built to cover the training needs of any business. Epignosis' products are trusted and loved by hundreds of companies and organizations around the world, from SMEs to large multinational companies and government organizations.